Bowling Green’s major goals this season are simple. The Falcons are striving to contend for the Western Collegiate Hockey Association championship and a berth in the NCAA playoffs. Entering a three-week break for the holidays, both goals are well within reach for BG, 11-3-2 overall and 8-1-1 in the league. The Falcons, ranked 13th nationally, are off until Jan. 3-4 when they face Robert Morris in a nonleague series. “I’m happy with the first half, but there’s still plenty of work to do,” said BG coach Chris Bergeron, who is in his fifth season. The Falcons’ start is their best since the 1995-96 season when they were 11-4-1 after 16 games. The Falcons are third in the league with 17 points, three behind co-leaders Michigan Tech and Minnesota State. But BG has played two fewer games than both schools. The Falcons’ .850 winning percentage in league play is the best in the WCHA. BG finished the first half of the season last weekend with a 5-5 tie and a 5-0 win at Northern Michigan. The Falcons rebounded to play well in the win after losing a two-goal in the third period of the tie. “That’s a positive place to be in, when the results have been pretty good, but we still feel we can improve,” Bergeron said. The Falcons were fourth in the WCHA coaches poll. BG hasn’t won a regular-season league title since 1987 or a league playoff title since 1988. The Falcons haven’t played in the NCAA playoffs since 1990. 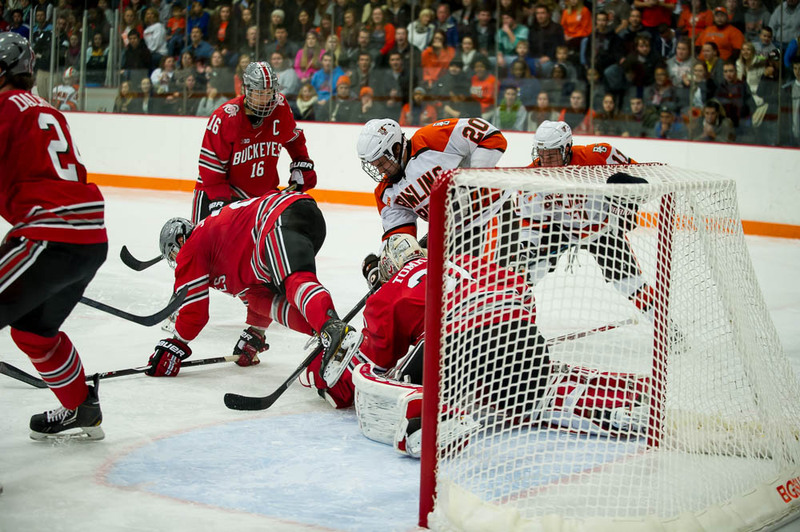 BG can earn an automatic NCAA berth by winning the WCHA playoffs or can qualify as an at-large team. The Falcons are eighth in the Pairwise Rankings, which mirror the NCAA selection criteria. Sixteen teams make the NCAAs, including the six league playoff champions. “We’re in that conversation for those. Those things are real,” Bergeron said. THIS WEEK: The Falcons will practice this week and then head home for Christmas after taking final exams next week. This is the final week of class for the fall semester. The Falcons return to practice Dec. 28. OFFENSE: The Falcons rank second in the WCHA in goals scored (3.21 per game). BG has benefitted from a balanced offense. Matt Pohlkamp leads BG with 13 points, while Kevin Dufour and Pierre-Luc Mercier each have 12, Brandon Hawkins has 11, and Ben Murphy and Mitch McLain each have 10. Dufour has nine goals, while Murphy has five, and Pohlkamp, McLain and Tyler Spezia each has four. The Falcons have scored consistently, even though veterans Mark Cooper, Dan DeSalvo and Adam Berkle have combined for just four goals; and Brent Tate has played just eight games because of a groin injury. Spezia, a freshman, has missed the last four games with an illness. “We have a chance to have a good second half when you talk about Cooper, DeSalvo and Berkle having four goals between them,” Bergeron said. TEAM DEFENSE: One of the major keys to the second half for BG is improved team defense. The Falcons are allowing 2.19 goals per game, only fourth-best in the league. “The only thing I don’t think we’ve done as well as I would have liked to see us do is defend,” Bergeron said. The Falcons have had too many turnovers in their own zone, and they’ve given up four or more goals three times. DEFENSE CORPS: Even though BG has defended well at times, it still has a relatively inexperienced corps. Senior Mike Sullivan has played well on the blueline, and the recent return of classmate Connor Kucera from a shoulder injury has been a boost. Sean Walker is only a sophomore, but often plays like a veteran; and redshirt-junior Dajon Mingo is in his first season as a full-time defenseman. Freshman Mark Friedman and redshirt freshman Nolan Valleau have played every game. GOALTENDING: Sophomore Tommy Burke and freshman Chris Nell have played well in goal for the Falcons. They’ve combined to start the last 11 games, and have started 13 of BG’s 16 games. Burke has a 2.33 goals-against average and a .917 save percentage in eight games. Nell has a 1.60 goals-against and a .945 save percentage in five games. PK: The Falcon penalty-killing ranks third nationally and second in the WCHA at 91.8 percent. Vermont is first at 94.6 percent, and Tech is second at 92.4 percent. The Falcons have allowed just one power-play goal in last seven games, a span of 32 chances. PP: The BG power play is second in the WCHA at 20 percent (13 of 65). The Falcons were 3 of 9 at NMU, but scored just two power-play goals in their previous eight games. “Our power play has to be more consistent,” Bergeron said. “It’s been hit or miss. That’s not good enough. The Falcons are 7-1-1 in games when they score a power-play goal. INJURED: Tate is expected to play against Robert Morris after injuring his knee Saturday against NMU. CLEARED: Valleau won’t face any supplementary discipline from the league after receiving a major penalty for contact to the head during Saturday’s game at NMU, Bergeron said. SWITCH: The Falcons originally were scheduled to visit fourth-ranked Tech this weekend. 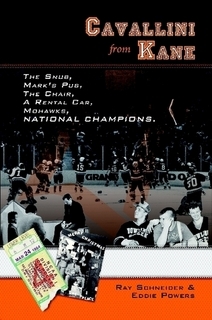 But the series was switched to Jan. 16-17 at BG’s request, so it wouldn’t have back-to-back trips to the Upper Peninsula. Tech used the switch to schedule a nonleague series against Minnesota-Duluth. The Bulldogs are ranked ninth and tied for first place in the National Collegiate Hockey Conference with No. 6 Miami.